3 bedrooms/ 2 baths. 6 people max. Five minutes from town or beaches, yet worlds away. Privacy in which to enjoy the 70' turquoise pool and gardens. 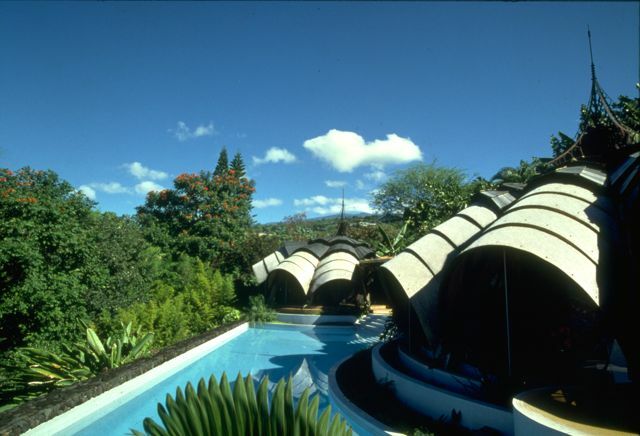 Ideal 'base camp' to explore the Big Island. Terri Watson serves as our booking manager and will work with you to make your reservation and answer your questions about your stay. The onsite team is led by Jeanne who oversees the crew and will be your on-island contact when you arrive. The Onion House is not suitable for families with young children (younger than 12) or for those who have difficulty with steps, due to safety considerations inherent in its design. Smoking outside only, please. No pets.